This is one of my all time favourite hot pot places in Taipei. Tucked away in an alley, it serves one of the most unusual tasting stock I have tasted anywhere. The specialty here is the suan chai pai rou guo or pickled vegetables with pork hot pot. Manchurian in origin, the hot pot is served in a traditional pot, with a mile high funnel and steamed up using charcoal. The soup is filled with loads of pickled bok choy and thinly sliced pork, crabs, and tofu lending it a mildly sour taste. It’s a very refreshing change to the other favourite, the spicy mala soup. 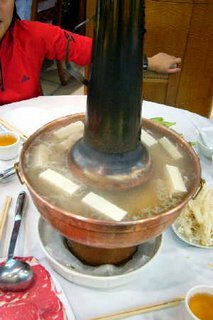 You can order an assortment of thinly sliced meats (beef, chicken, lamb, pork), vegetables, noodles and tofu (the frozen ones have a particularly interesting texture that soaks up all the flavour of the soup) to add to the pot. But what brings out the flavour even more is the array of condiments – Chinese parsley, sesame paste, chilli, Chinese wine, vinegar, crushed garlic and ginger - that you can mix together to create your very own dip. Heavenly. I make it a point to swing by this place every time I am in Taipei. I have not had this in the middle of winter as yet but I can only imagine that it would be divine.